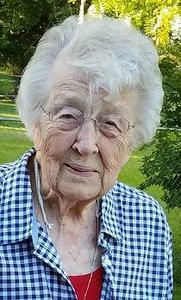 Mildred “Pat” Lubbers Tripp passed from her earthly life into the arms of her Savior on February 25, 2019. She was born on April 2, 1924 to Andrew Lubbers and Mary Artz Lubbers. She grew up in Hamilton, Michigan and graduated from Holland High School 1942. She served her country during WW2 by working in a factory that made parts for airplanes. Through a friend, who later became her sister-in-law, she was introduced to the love of her life, Julius Tripp. They married on June 12, 1947 in a marriage that lasted 49 years. Millie was a faithful wife and loving mother who instilled integrity, a hard work ethic and strong faith in her children and grandchildren. She and dad were mission minded and wanted all her children to be also. There were many meals shared with missionaries on furlough, or international students. She was a committed Christian who put her faith first in all things. Her faithful dedication was to a fervent prayer life. No one was a stranger to her. Everyone felt welcome in her presence and were blessed by her prayers for them. For many years she and dad faithfully gave to Portable Recording Ministries, a ministry that provides the Bible in audio so everyone will have the opportunity to hear God's word in their own heart language. For over 20 years, she was a certified instructor for Crossroads Bible Institute, a faith-based prison reentry education program for people in prison around the world. Millie was a humble servant for her Lord, never taking credit but always giving all praise to Him as she pointed upward. She is survived by her children Dave and Joyce Tripp, Mary and Bill Curry, Dan and Claire Tripp, Nancy and David Martin and Steve and Jamie Tripp. Her grandchildren Kim and Mark Drooger, Kristi and Tim Overbeek, Karin and Cameron Schober, Jonathan and Bekah Curry, Andrew and Brandy Tripp, Marianne and Jared Bridges, Thomas and Monique Tripp, Sam and Colleen Martin, Sarah and Dave Porter, Pete and Liz Martin, Megan and Martin Veliz, Blake and Bryce Borgman, Mackenzie Tripp and 28 greatgrandchildren and two great great grandchildren. Millie was preceded in death by her parents, husband, sister Gladys Mosier, brother Julius Lubbers, sister Lorraine Lubbers, and brother Melvin Lubbers. The visitation will be 5:00 – 8:00 PM Thursday February 28 at the Christ Memorial Church Chapel, 595 Graafschap Rd., Holland Michigan. Funeral services will be held Friday March 1, 11:00 AM also at Christ Memorial Church. In-lieu of flowers donations may be made to Audio Scripture Ministries 760 S. Waverly Rd. Holland, Michigan 49423.